Baby kilts are not something I thought I would find myself writing about. Babies after all can't walk until they are about a year plus, so would a kilt look good on a baby? Well I've done some research on the net, and believe me they look very cute. 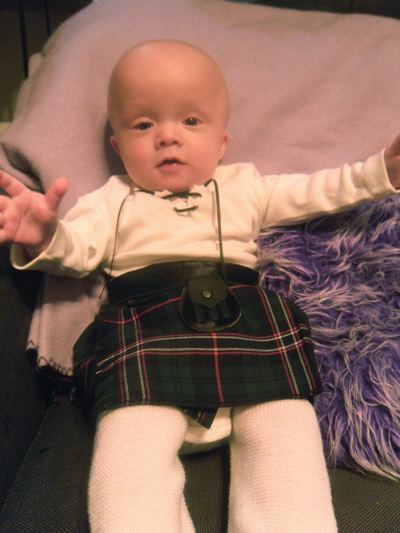 So why do you think I have the sudden urge to write about kilts for babies? Well it could have something to do with the fact that I am the proud daddy of a three month old little boy called Conner (his age at the time of writing this page). As its not at all unusual for parents to dress their slightly older children in kilts, I thought it might be fun to see what's available, if anything, for babies. Well I was slightly surprised to say the least, there are 729,000 pages to be found on Google, for that search term. So are they real kilts? well lets just say that in order to have a real kilt made to measure for your baby, most parents would find the price just a bit to high. Bearing in mind that babies grow at an astonishing rate, you really need to find a kilt that is affordable, as well as functional. So with that in mind, here is a selection of kilts you can buy for your baby. One visitor to the web site, Tess from Sweden, did just that and bought a kilt outfit for her son Connor, for his naming ceremony. You can see how wonderful Connor looks in his kilt, in the photo below. Below you can see a photo that I found so cute, I just had to put it on this page. Although the little ones are toddlers rather than babies, I'm sure you will agree they look fantastic in their kilts. Most of the baby kilts available have velcro fastenings (real kilt belt and buckle fastenings would be unsafe for your little one). They are also 100% machine washable, so they are obviously made from man made materials. This I find very practical considering who is going to be wearing it. So what about the price I hear you ask. Well they start at around ten pounds sterling (UK prices) that is for a kilt to fit a newborn to four month old. For a slightly older baby four to twelve months, the cost is around fourteen pounds, these prices include postage within the UK. Prices naturally will differ between manufacturers, but I personally find this a very small price to pay for such a delightful item of clothing for your little one. And do bear in mind that these kilts are designed to be unisex. So what can you find to complete the outfit? Believe it or not I have found a company who also supply a Jacobite shirt to fit twelve to twenty four months. They even supply a sporran, which you can fasten around your toddlers waist, at a very affordable seven pounds. And to complete the outfit, how about a pair of kilt hose, to fit shoe size three to seven (again UK sizes) for only six pounds. So as you can see, you can fit your baby out with a kilt outfit at a very affordable price. But what if you don't want to buy a kilt for your little one, what if you want to make it yourself? Well you could follow the wonderful example from Deb, who wrote to me from Australia asking where best to buy a kilt for her son Hamish. After due consideration Deb decided to make a kilt for Hamish, you can see the excellent result below. 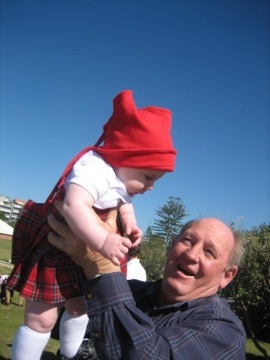 And of course Hamish's dad is very proud of his son's kilt, as you can see below. And mum and dad are not the only ones who are proud to see Hamish in his kilt, Grandpa is also delighted with mum's sewing talents as you can see below. 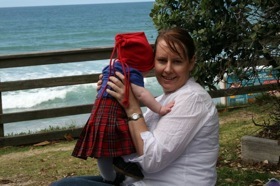 So as you can see, making a kilt for your baby is possible, as Deb has shown here, so why not give it a try yourself? And when he grows out of it, he may well ask you to take him to your local kilt maker, to have him measured for his next kilt. 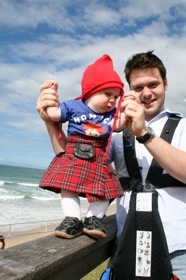 He will also have the photos to show off to his first girlfriend, of how cute he looked in his baby kilt. For further information on finding a kilt for your baby, drop me a line using the Contact Us page, and I'll be glad to help.